Do Hedge Funds Effectively Exploit Real-time Economic Data? Applying a linear regression to measure the sensitivity (economic data beta) of each hedge fund to monthly changes in economic data. Sorting funds into tenths (deciles) based on economic data beta and calculating average next-month equally weighted risk-adjusted performance (7-factor alpha) by decile. The seven monthly factors used for risk adjustment are: equity market excess return; equity size factor; change in 10-year U.S. Treasury note (T-note) yield; change in yield spread between BAA bonds and T-notes; and trend following factor for bonds, currencies and commodities. About 17% (9%) percent of equity hedge funds exhibit statistically significant positive (negative) economic data betas. Based on equal fund weighting, the top decile of economic data beta outperforms the bottom decile by 5.5% annualized average 7-factor alpha over the sample period. By the end of the sample period, a $1 investment at the beginning of 1997 in the top decile generates about five times the wealth of a $1 investment in the bottom decile, though the top decile has a deeper loss during the 2008-2009 financial crisis (see the chart below). 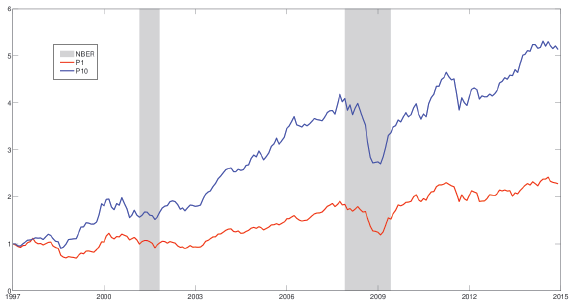 The following chart, taken from the paper, compares net cumulative returns from investing $1 at the end of 1997 in the equally weighted decile of equity hedge funds with the lowest (red line) and highest (blue line) economic data betas through the end of the sample period. Gray shading indicates (retrospective) NBER economic contractions. The highest decile usually outperforms but has a deeper drawdown during the 2008-2009 economic contraction. In summary, evidence indicates that some equity hedge funds achieve elevated performance by exploiting real-time economic data. The study does not address the nature of portfolio changes that funds with high economic data beta make in response to changes in economic data. There may be snooping bias, inherited from prior research or introduced via the moving average parameter, in the construction of the economic growth index. Identification of which hedge funds have high economic data beta is beyond the capability of many investors. Moreover, most investors cannot hold a basket of hedge funds with high economic data beta to capture its effect reliably, and changing funds in response to changing betas may not be feasible in a timely way.